RefurbUPS will purchase surplus or excess UPS equipment and offer you fair value. Whether you're upgrading your power infrastucture, downsizing or consolidating, we can help you maximize your value on your existing UPS equipment. Unlike many of today's UPS manufacturer trade-in programs, we pay cash directly to you with no restrictions on how you spend it. Power protection devices present a unique set of issues when it comes to end of life cycle disposal and recycling. All power protection systems contain circuits and electronics that are not 'landfill friendly', much like computers, and need to be disposed of in environmentally responsible ways. To make matters even more complicated, many uniterruptible power supplies use lead acid batteries like the one found in your automobile. 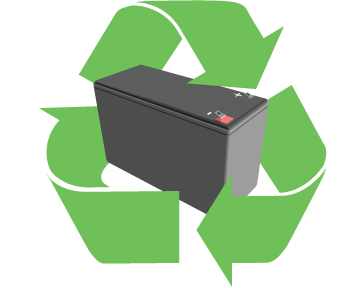 The law requires that lead acid batteries be properly recycled to prevent poisonous lead and suphuric acid from contaminating the ground and water. Many asset recovery and scrap operations lack the necessary equipment, systems, and partners to ensure that none of the toxic components of your UPS system make there way into the environment. Don't take chances with your compliance to all state and federal regulations by bringing your power protection and UPS equipment to us for proper recycling and disposal. Green asset recovery starts with the basic three processes of Reduce, Reuse, and Recycle, and we apply this philosophy religiously to all of the equipment we recieve. Our goal is to keep as much material as possible out of the landfill, to Reduce the landfill impact of disposal.